Please address why the city has been unable to come to terms with Verizon for FIOS internet and TV service and how your approach would differ. I am pleased to provide their responses here. Feel free to comment on them. (No mudslinging please!) I also encourage you to visit their websites so you can learn more about them. You may also want to contact the candidates individually for more information. I have provided the websites and email for each candidate below. I present them in the order that I received them, grouped by mayor and council. Do not stop reading after the first few! They're all worth studying closely. Some of the statements are a bit casual while others are more formal but in the end I felt that nicely reflected more of each candidate. But for that reason, I feel obliged to show exactly what I sent to each candidate originally. I write a blog (The Libes Libation) that covers cable and telecommunication issues in Montgomery County and is read by many Rockville voters. I would appreciate if you could provide me with a statement explaining why the city has been unable to come to terms with Verizon for FIOS internet and TV service and whether you believe Rockville's position is correct or how your approach would differ. Hopefully, if Verizon were to work with us in good faith, we could bring these matters to a close very soon. There have been numerous instances across the country of damage done by phone companies (in some instance, Verizon) when laying their new fiber. We also think it would be appropriate for Verizon to pay fees to the city government commensurate with the city government's additional cost of inspecting their work to make sure everything is done properly. An additional concern that we continue to have, which you need to be aware of, is that Verizon refuses to agree to have all Rockville homes wired within even five years. Even if the city government were to bring these matters to a close with Verizon tomorrow, you could potentially end up waiting another five years or more for Verizon to bring their FIOS service to your street. We have asked Verizon to agree to have all Rockville homes wired within two to three years, but they have thus far refused to agree to this. We also wanted to make sure that they do not purposefully first wire more affluent neighborhoods, and leave the least affluent for last. Verizon has thus far refused to address this potential concern as well. I would appreciate a response by November 1. Feel free to email or call if you have any questions. So that was the email that each candidate received. Here are their responses. Here is my answer taken directly from my website. The FiOS technology is superb and would offer numerous benefits to residents for phone, television, and Internet access. However, Verizon has a mixed record of installation elsewhere in Montgomery County including cutting cables and damaging property. In addition, Verizon will not commit to a 2-year schedule for installation everywhere in Rockville (as requested by Mayor and Council), including for example, communities such as King Farm not getting the service for several years. Finally, it appears that Verizon wants a substantial discount on Right Of Way fees published by Rockville in 2003. I think Mayor and Council are correct to insist on standards for correct installation and to insist on payment of reasonable fees. The City will have numerous costs associated with the installation of the fiber cable including inspection and putting the grid on its GIS system (for maps). These City costs should be covered, otherwise it is a subsidy to a private company. I would not insist on the 2-year installation timeframe; there can be some accommodation here. Mayor and Council recently said that they're waiting for Verizon to come back to Rockville to start talking again. If elected Mayor, I would initiate the discussions and try to come to a reasonable deal. Thank you for contacting me on this important issue. As the only mayoral candidate in the telecommunications field, I feel strongly about this issue. It is imperative that Rockville move forward on this initiative with a great sense of urgency. Rockville is truly an international city as it is a part of the Greater Metropolitan Washington, D.C. area. More than one third of all Rockville residents were born outside the U.S. and many more have international ties. How can Rockville expect to compete on the world market without the infrastructure necessary to do the job? How can we truly be a “world class” city attempting to “make do” with past centuries’ copper connectivity? Additionally, as gridlock increases on our roads, telecommuting becomes evermore important as a major component in ameliorating our traffic nightmares. The possibility that many office workers, consultants and entrepreneurs can stay off the roads in home offices is essential if we’re to get a handle on traffic and our environment. Keeping people connected and out of their cars can make a big dent in Rockville’s carbon footprint. With its extreme bandwidth capabilities, fiber optics is the one technology that will allow more telecommuting solutions than any copper-based scheme. Office workers would be able to virtually attend meetings anywhere in the world (real-time teleconferencing) and conduct business via network-based applications, while their families enjoy HD television, ultra-clear telephone conversations and high speed Internet. Eliminating commutes and keeping families together will greatly increase Rockville residents’ quality of life. Lastly, the U.S.A. was built on competition. Arbitrarily preventing competition has never been good for Wall Street, Main Street or your street. Artificially maintaining the status quo of the cable company’s monopoly for high speed access is not in Rockville’s collective and long term interests. Offering citizens high speed telecommunications options will inherently bring down prices and make even better technology solutions available in the future. It has been stated by my opponent that the current fiber optic provider (Verizon) has been unwilling to work with the City in the deployment of fiber optic solutions. I find this troubling in that most surrounding jurisdictions have had no such problems. As long as Verizon or any telecommunications provider can do its part in putting things back the way they were prior to the installation of fiber, we can move forward with little or no impact to Rockville’s commuters or taxpayers. There were many more obstacles in building Rockville’s new Town Center than there are in securing a win-win arrangement for the installation of citywide fiber optics. It takes only the will to get the job done. As Rockville’s Mayor, I will get the job done. Verizon does not have the best record when it comes to their standards of work during and after cable installation. The work done in the County was often left uncovered at the end of the day, causing driving hazards and significant access difficulties for residents. Verizon has asked for a reduction of the per foot rate as compared to what Comcast paid. They have yet to provide a justification for this request. They won't have fiber to all of Rockville for at least five to seven years. And finally, they refuse to return to the table to continue the dialogue. This impasse has lasted for over a year. Two weeks ago, I saw the Verizon government relations representative at the Rockville Chamber of Commerce candidate forum. I asked her if I could count on her to meet with the City after the election. She agreed that she would. I am counting on her to keep her word and get the process moving again. I cannot over-emphasize how strongly I feel about the value of competition on the cost we are charged by Comcast for cable. I hope Verizon will be part of the solution. If elected to the Rockville City Council, I will want to get the complete details on why the deal with Verizon is not able to move forward. We should not keep Rockville residents as well as surrounding areas from benefiting from competition like Verizon. If Rockville creates an unfair situation, it might be better for Montgomery County to negotiate for the entire Rockville area. I am concerned that the all the members of the Rockville Mayor and Council have not been provided the complete details on this request. As a Rockville council member, I will demand accurate information be provided to all council members. I am a strong proponent of competition and want to know why the same deal is not provided to Verizon that was given Comcast. I will listen to all sides of this issue and expect the entire Rockville City Council to have a vote in this decision, but not before all accurate information is provided. Thank you for asking for my view on the fiber-optic system being available to Rockville. Please see below the status of the City's issues with the Verizon wireless proposal. I asked our City Manager to give me the current disposition of our negotiating. You can see by the text that follows, we are trying to come to an agreement. I delayed responding to you until I had the facts. Thank you for your patience. Please see below in response to your call of earlier today. I sent this to Brad Roarke's blog. The City of Rockville is eager for competitive cable and Internet services to be available to its residents. We continue to negotiate with Verizon on an agreement that would allow the company to install and keep its new fiber optic cables in City streets, sidewalks and other rights-of-way. Among other things, this agreement simply requires the company to obtain necessary and routine permits to undertake construction and conduct its business using City streets, sidewalks and other rights-of-way. The permit process is essential to ensuring the public's property and all community interests are protected. Without the City's oversight, construction projects in the City's rights of way would present a very high risk of seriously damaging City assets, other utility infrastructure, and even private property. The Mayor and Council have directed that the fees associated with these permits cover the city's costs, so that taxpayers are not, in effect, subsidizing a for-profit commercial enterprise. The normal fees that the City charges for work in the rights-of-way are based on a cost study done by an outside financial firm. For a project of the size proposed by Verizon, there is a great demand placed on City government services among them, permit application review, engineering review, traffic plan review, traffic control, review and oversight of plans for repair and restoration of streets, sidewalks, and any utilities that may be damaged; and inspection of the work as it progresses and upon completion. Verizon has declined to pay these fees and has requested substantial reductions in them. The City has offered a number of alternatives that, we believe, would meet both Verizon's and the City's needs. We are continuing to work with Verizon on these alternatives and hope to make progress soon on these negotiations. The City also wants Verizon to commit to a faster and more reasonable timetable for rolling out the FIOS service to all residents in the City. Based on Verizon's current schedule, it may take five years or more for service to be provided to King Farm, which is not acceptable. Thanks for the opportunity to comment. First, this is a matter that needs to be discussed and hopefully brought to a satisfactory conclusion by negotiations involving all members of the new Mayor and Council. I believe it would be counter productive for me, or any of the incumbants, to give detailed positions on the current areas of disagreement between the City and Verizon. There have been real and substanial differences between the City and Verizon and, in my judgment, the past atmosphere for reaching accords has not been very positive for a number of reasons. I believe we should make a concerted effort, as a new Council, to move ahead, in a more positive context, and I feel that is possible. I have heard from a number of my constituents who are supportive of Verizon and I want to give this an opportunity to succeed. Having said that, I can also say that I am a firm believer in the value of open competition for government contracts and arrangements with businesses and corporations, and, I am concerned about fairness and cost impacts on all residents. Competition between service providers is the consumer’s strongest way of ensuring best service at the most competitive price. And so, I do believe that it behooves the City of Rockville to find a way for Verizon to compete with Comcast in Rockville. I am not privy to the details of the present impasse between Rockville and Verizon but based on what has been reported, I do agree that the City should insist on a firm time frame for Verizon to wire the whole city. What that time frame should be (3 years? 5 years?) remains for me an open question. With respect to what neighborhoods should be wired when, I do not see this as a major issue, as long as there is agreement that all neighborhoods will be wired, and as long as the timeframe to accomplish this is reasonable. Whether Verizon should pay the full cost of City inspectors is also an open question for me. It is in Verizon’s self interest to do the work in a satisfactory fashion. If it fails in this task (rips up other infrastructure, does not repair roads that it digs up, etc.) it could be subject to legal action. So, to what extent is shadowing Verizon, in order to inspect their work and then charge them for it, really necessary? Again, I am not privy to the details of the present impasse, so it is difficult for me to answer this, but I raise it as a concern. I would be interested in learning more whether Verizon has a general problem of negotiating deals or whether Rockville is unique (or nearly unique) in their experience. It is a fact that Verizon has managed to enter into agreements with other jurisdictions, so is it possible that Rockville is just a particularly difficult partner? I notice that in recent weeks Rockville came to another negotiating impasse, this time with an artists who was asked to create a piece of art for our new Town Center. Is this just a coincidence, or is it possible that Rockville sometimes takes so principled a stance in negotiations that practical considerations are overshadowed (i.e. we can’t see the forest through the trees)? If elected, I will want to explore the questions raised above as a road map for returning to the table with Verizon. While certainly no deal is better than a bad deal, in the long run, Rockville residents should not have to accept not having a full scope of services that Verizon can provide and is providing for many of our neighbors. By making Comcast compete with Verizon the services of both companies will be strengthened and Rockville residents will be the real winners. First, I have to say that I DO intend to bring everyone to the table so that we can engage in open and productive negotiations! Having said that, I also submit two other oft-repeated and over-used generalities connected with this issue -- I do not like the monopolistic franchise regime (full disclosure here as I am a disgruntled customer of Comcast) and I would like to see FiOS available to me and everyone else in Rockville as soon as possible. 1. Infrastructure damage and replacement -- the installation of fiber optic cables necessarily involves the tearing up of City streets, sidewalks and other rights-of-way. The cost of replacement and any other damage as a result of installation should be borne by Verizon. Indeed, I don't think this is an issue as this is the standard operating procedure for any utility's work. I would add that the City and Verizon coordinate such infrastructure work with other utilities as much as possible, so that the same street is not torn up and rebuilt several times in a short time, causing a prolonged disruption in the community. I have seen too many times where one utility performs its work to be followed by another utility in the same right-of-way, where the jurisdiction seemingly could have limited the disruption through permit coordination. 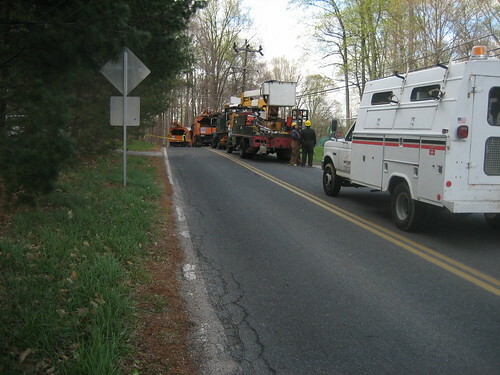 This level of coordination may have an impact on the roll-out plan if there is other extensive utility work concurrent with the installation of the fiber optic system. 2. Fees -- I appreciate the City's need to charge a fee that recovers its costs related to the permitting and oversight of the installation of the system. I favor, however, the position that the FiOS system is both a private, for-profit endeavor and a community benefit. After all, we want our City to be a leader, on the cutting edge, in telecommunications. It is good for our City and its residents. Although I need to do more homework on the extent and scope of the fees at issue, I would be more flexible on fees and balance the costs between Verizon and the City on the principle that there are necessary public costs for such a community service. Perhaps this is the essence of the City Manager's recent statement that the City has offered a number of alternatives that may satisfy both Verizon and the City, alternatives that I understand will be discussed in negotiations that will kick in again after the election. 3. Roll-out -- With one condition, I believe leaving it to Verizon and the market for scheduling the roll-out is appropriate. The irony in this instance is that by delaying the implementation to get a better deal on timing for certain customers, we've prolonged significantly the implementation time for all customers. The one condition is to employ all reasonable means to ensure that the rollout is effected equally in affluent and less affluent areas of the City. In the existing politically charged environment concerning equality of services for certain areas of the City, it is prudent to attempt a balanced rollout. Thank you for your interest in our opinions as candidates. With regard to the FIOS issue in Rockville, following the explanations and counter-explanations as presented in the Mayor and Council sessions has been frustrating as complete information does not seem to be available. Open competition for cable service is something that we need in Rockville, and as your next councilperson I would support engaging in dialogue with Verizon as to how we can bring Verizon service to Rockville. With our continuing focus on making Rockville a high tech, biotech nexus for Maryland businesses, it is imperative that we have the advanced infrastructure and competive service not only for entertainment purposes but to support information technology. Some issues that will have to be resolved include access to condo and apartment buildings that are contractually obligated to Comcast and the issue of equal access throughout the City. It is troubling to me that alternate reports claim that Verizon FIOS has been installed in other areas of the County at a lesser cost. I don't know yet why that reported cost discrepancy exists. I would like to bring all the interested parties to negotiation and find out what is the real situation with Verizon. So far, I have heard only one point of view expressed, that of the current Mayor and Council. I would like to hear from Verizon directly as to what is necessary to have a win-win for the citizens of Rockville. I thank you for taking the time to send in your question to me. I do apologize that I did not get back with you earlier, as after work and on the weekends my days and nights are consumed with putting out flyers, going door-to-door and meeting with the residents of Rockville and putting out signs and such. I'm running a grassroots campaign and simply don't have anyone else to do these things for me and don't have a contribution war chest to reach into to send out mailers and such. While I won't portend to know all the details of the past Mayor and Council's dealing with FIOS, nor all the nuances surround the disagreements and both parties inability to reach an amicable decision that would have benefited the citizens of Rockville, such as myself, who is sick and tired of paying these inflated monthly bills to COMCAST, as a new council member I will definitely have a different strategy in dealing with FIOS. I can clearly say, competition is good for the consumer and offers choice. Fiber will come to Rockville and WE will have options. I will work with my fellow Council members and the Mayor to bring ALL parties to the table and not let sidebar meetings and single opinions dominate such a serious and far reaching effect decision. I will call upon my mediation skills and coalition building talents to really vett out the issues so that we can get this process moving forward and so relief as soon as possible can be brought to the deserving citizens of Rockville. I'm for open competition and choice and will be an honest broker for the citizens of Rockville. It's time for a change and I hope that the citizens will honor me with their confidence and trust that I will make that change for them and everyone that has a vested interest in this matter. Thank you for your great question. I encourage you and others who are interested in hearing more about me and my campaign platform issues to visit my web site at www.vote4anderson.com. I would be honored to have your vote on Nov 6, 2007. I'm glad you reached out to me to get my opinion on this - it's very important. I have to say, I personally would love to have a choice in my cable provider and I think bringing Verizon into the City and giving residents choices would be invaluable. However, I would only support that if Verizon can provide assurances that they will not destroy our infrastructure and would compensate for damages and other costs having them install their infrastructure would put on the City. Taxpayers should not have to foot the bill for poor installation of FIOS. But ultimately, choices are important and I would hope to be able to bring them to Rockville. On Monday, October 22, 2007, I attended a debate among the candidates for mayor and council of Rockville, Maryland. I was curious if fresh blood might be the solution to breaking the logjam presently preventing Rockville citizens from getting Verizon FIOS internet and TV. Given the upcoming November 6 election, this may be an opportunity to effect change by voting. I don't avidly watch Rockville politics but I have attended council meetings on occasion so I'm familiar with how interesting (to put it politely) their behavior can be. A candidate debate seemed to promise an evening even more entertaining than professional wrestling - with an equal amount of simulated grappling. Although it was called a debate, it was nothing close. Organized by the Rockville Chamber of Commerce and intended to focus on business interests, 14 candidates stood on stage, each starting with a two-minute position spiel. Questions were then doled out to each candidate round-robin. They had 90 seconds to answer their respective questions. This was repeated again with an additional round of questions. So although questions were solicited from the audience (and I submitted one about Verizon), there was no debate and no opportunity for followup or rebuttal. My question: Please address why the city has been unable to come to terms with Verizon for FIOS internet and TV service and how your approach would differ. Although only two candidates got the question on-air, I did also speak to several other candidates afterward and put the question to them as well. All in all, I was disappointed by the responses - only one candidate expressed any grasp of the details of the issue - and even his grasp was tenuous, seemingly accepting of a large portion of the current position held by Larry Giammo, Mayor of Rockville. The best that could be said was that the candidates understood that it was a valid issue. What I'd like to do at this point is contact all the candidates, give them time to look into the issue and provide their position. We'll then be able to compare them. For candidates who would like a little background, it will be helpful to read what I wrote earlier about the fee situation. Besides fees, the other big issue appears to be the provisioning schedule. I have never addressed the schedule before but I understand that the Mayor is still insisting on 100% coverage in 3 years. To be blunt, Rockville is simply wrong to demand this. By comparison, the MC franchise provides staged service areas which factor in density and other issues. That seems much more reasonable. If Verizon was being granted monopoly status, I would make a different argument but since Verizon is entering the field as a competitor and since Rockville has done little but postured for coming on two years now, Rockville has little basis for its schedule demands. Frankly, if Verizon stuck Rockville at the end of their current schedule, it would be justified. But it's worth looking at Verizon's county-wide schedule that was created during the county-wide negotiation. Notice that Rockville falls in what's termed the Middle Service Area. 3.1.2. Middle Service Area: In the Middle Service Area, the Franchisee shall offer Cable Service to significant numbers of Subscribers in residential areas within three (3) years of the Effective Date of this Franchise, to at least fifty percent (50%) of the residential areas within the Middle Service Area within four (4) years of the Effective Date of this Franchise, and to all residences within the Middle Service Area at which such service is requested within five (5) years ofthe Effective Date of this Franchise, except as specified in Section 3.2. If Franchisee is unable to reach agreement with the City of Rockville to obtain construction permits for the FTTP network under reasonable terms and conditions, as determined by Franchisee, by December 31, 2007, these timeframes shall not apply to Franchisee's provision of Cable Service to residences served by Franchisee's Rockville and Montrose wire centers. Instead, Franchisee shall offer Cable Service to all residences served by the Rockville and Montrose wire centers at which such service is requested within four (4) years of obtaining construction permits for the FTTP network from the City of Rockville, except as specified in Section 3.2. The referenced section 3.2 deals with density requirements and related issues as I mentioned earlier. Go ahead and attach a comment to the blog (or email me) if I've overlooked any related issues that the candidates should also address. At the end of the week, I'll contact each candidate for a response. Please stop sending me links to the hammer lady! Yes, I know about it. I was even tempted to write about it. But I think there's little to add that hasn't been said already. 450 people posted comments to the Washington Post article about it! How much more is there to say? For those of you that still haven't heard the story, Mona Shaw, 75, of Manassas VA, a kindly grandmother type right out of central casting, was so mistreated by Comcast - starting with a missed appointment, a botched install, a total loss of service, and finally ending with abuse-in-person at the local Comcast office - that she reached her breaking point and proceeded to go home and return with a hammer to dispense justice, outraged-grandmother style. Here's a link to the full article by Neely Tucker, Washington Post Staff Writer. The reporter bent over backward to give equal time to Comcast. In the article, Beth Bacha, a Comcast VP, noted that Comcast has more than 25 million customers, "the overwhelming majority of which are very satistified with their service." I'd love to see the evidence of that. Their customer base is not that evidence given that many Comcast subscribers live in non-competitive areas. And for customers fortunate enough to live in a competitive area, Comcast may be having a very tough time - especially if my own experience is any guide. Recently a member of my own community posted a note to our neighborhood mail list. She described how she had been experiencing Comcast outages for two weeks and wanted to know whether other neighbors had been experiencing similar problems. Ten people replied. (I didn't participate in the discussion - I just watched.) Nine said they had switched to Verizon FIOS and doing so was very easy. Repeatedly, people said FIOS TV and Internet were rock solid using terms like "great", "never a problem", "couldn't be happier" and, from one person, "Switch to FIOS now! Run, run from Comcast." Oh, the tenth person? He said he was fed up with Comcast and was about to switch. Bottom line: Not one person defended Comcast or admitted to remaining a Comcast customer. This is remarkable - not just because Comcast has had the market to themselves for so long but because they've had years to work out problems in their operations. And from the statements I hear around the neighborhood and in newspaper articles like the hammer lady, Comcast has done so badly that people are desperate to try anyone else - even at a higher price. Needless to say, Verizon is finding fertile ground here and, for some people, offering cheaper bottom line prices with faster service to boot. It's hard to see a rosy future for Comcast right now. Or any future. It all depends on Verizon. While Verizon has already screwed up in the past (poorly trained subcontractors, for example), people appear willing to accept mistakes if they're corrected and if the end result is better. I hate to write Comcast off entirely. If we've learned anything, we've learned that we need competition in the marketplace. We need both Comcast and Verizon to prosper. Are you listening Comcast? Last week, the Gazette had a curious article about County Cable Montgomery, the PEG channel that televises official county business such as county council hearings. "We are wanting to make the cable channel more accessible to folks. ... we’re trying make the programming more interesting and increase its relevance to the public." "We are trying to be more responsive to our audience. We do not have access to Nielsen ratings, but we know that we have activists that look at the channel because of the number of replays for the council and town hall meetings... We believe that the missing piece is the young people." All I can say is: Huh? This is the county's government channel, not Disney or TNT. Why spend money trying to attract a different audience than the one you have? There are dozens of outlets for "young people" already. Actually, there are hundreds. More. But how many outlets are there for local government functions? Committee meetings? Commissions? Park and Planning hearings? School Board meetings? Community Association Meetings? Court cases? I would love it if I could see more than the county council meetings. But I can't unless I show up in person. And that's just unrealistic. Frequently, I only find out about something interesting having happened afterward. I can't go to meetings all day just in case something were to happen! Nor can I afford to show up and then wait an hour for the item of interest to me to occur, a frequent issue with council meetings. But the solution isn't to put all these meetings on the government channel. The solution is to make them all available as podcasts or videocasts. This would expand the ability to offer more government programming to an unlimited degree. Ten meetings at once? No problem, just generate ten podcasts. And it would expand accessibility as well. One could argue that TV reaches a broader audience - after all, more people have TV's right? True but misleading. The Cable Office estimates that 230,000 households are capable of receiving the PEG channels. However, Montgomery County's own 2003 census reported that 274,000 households had internet access. And that census is four years old, so it is a sure bet that the number of households with internet access is even higher given the dramatic decrease in computer prices since that time. According to the HDTV Almanac, subscriptions for broadband services increased 21% just this year alone. And I have to question how many people are even using their TVs to watch the meetings that are currently broadcast. I sure don't use mine. I have never watched the government channel on my TV. Never. But I know plenty of people who watch it at their computers. After all, most of my waking day is spent at work anyway. I don't have a TV on my desk there but I do have a computer. So if I need to watch a government meeting in real-time, it is likely going to be during office hours. I appreciate that some people work from home - indeed, I occasionally telecommute myself but even then, I'm in front of my computer, not my TV. Without data, we are left to speculate how many people watch the PEGs using their TV. It is accepted wisdom that you can not optimize what you cannot measure. Alas, that doesn't appear to be stopping the county. Indeed, the only statistics cited by Donna are the number of downloads, not the number of TV viewers. Last time I checked, the franchisees do not report PEG viewership. And if the PEG network has any kind of TV viewership statistics, I'd be very surprised because in all the years that I served on the county's cable advisory committee, our requests for this information were repeatedly rebuffed - the claim: Franchisees don't supply the information - and the alternatives (surveys by phone or paper mail) are either too expensive or lack effective response rates. Besides improved access and a larger selection of material, another advantage to digital distribution is that it is cheaper to the franchisees. And the county pays nothing for the internet feed since it is a benefit of the franchise contracts. But there's no reason to. The packets invariably stay on the local franchise networks since they're delivered only to Montgomery County residents. Thus, the costs to the franchisees are nil. Back to the issue of the county's concern over the reaching youngsters - I still don't get it. Although demographics are what matter to commercial stations, they should not be of such concern to a government station. Government's job is to release information. Sure, it should also be in a form that is understood. But it doesn't have to be translated into kid-speak. It doesn't have to be dumbed down. The kids aren't watching anyway. When I was a kid, I used to come home from school and flick on the TV. But I see my own daughter and her friends - all they want is to download videos from YouTube and other content sites. And I can see why. Sure the video quality leaves a lot to be desired but the kids get a much bigger selection to choose from (as well as being able to upload content) and they want that ability. On the whole, it is a much more enjoyable experience and it is the future of video. Not a traditional fixed TV channel. I do appreciate the TV channel isn't going away. However the county needs to think long and hard about the most effective way to make use of a channel like CCM. According to Patrick, new programming includes more "newsmagazine-ish" material in an attempt to make the programs more interesting. "We have the ability to go live a little more now and be doing more live programming at county events." Don't forget video streaming, Patrick. I've used the County's video streaming capabilities and they're where you should be putting our precious tax dollars. That and digital archives, suitable for podcasts and videocasts. We don't need "newsmagazine-ish" formats. Just give us a high-quality raw feed. Call it CSPAN-Local. If you don't know what I mean, you need to watch CSPAN, Patrick! This is what citizens want, not predigested pablum. Oh, and about CCM TV? How about leasing it back to the franchisees or sublet it ourselves. Even in the wee hours of the morning, there are bound to be idiotic infomercial producers who are willing to pay good money - money that you could then use to further enhance the podcast/videocasts and video streaming that would truly benefit Montgomery County. Montgomery County officials are warning Comcast customers to study their July bill closely. The July bill contains a notification of an upcoming change to the terms-of-service agreement with an opportunity to refuse within 30 days of receipt of the bill. In short, Comcast wants you to give up a number of rights you currently have and instead agree to, well, something less. Specifically, Comcast is changing your terms of service so that you agree to resolve disputes with Comcast through arbitration. In return, you relinquish your "right to pursue any legal remedies against Comcast in court, including claims for negligence, fraud or intentional wrongdoing." Nor can you join in a class-action lawsuit. Plus you accept limits on times in which you may file claims. However, Comcast reserves the right to seek similar remedies in return. Obviously, this is heavily tilted in Comcast's favor. So why would you agree? Because it's in the fine print that no one reads and is structured as an "opt-out" meaning that you agree if you do nothing - which is what most people will do when trying to plow through a stack of bills, each filled with the usual advertising and other extras that are discarded within seconds of slitting open the envelope. If Comcast really wanted you to know about the change, they would advertise it in the same way that they market all their promotions - using numerous commercials, flyers, and emails. But their current approach combined with the opt-out technique is unethical. And it appears to violate the franchise agreement as well. Copies of all notices, promotional or special offers sent to Subscribers and any agreements used with Subscribers shall be filed promptly with the County. All forms and notices distributed to customers which describe customer service policies and procedures shall be subject to County approval. According to the Cable Office, this prior approval was not sought. The county has not stated if it will seek penalties or for Comcast to cancel the change for Montgomery County customers who fail to respond. I recommend you take no chances and opt-out. To do so online, visit comcast.com/arbitrationoptout and fill out the form. You will need your Comcast account number from your bill. Print a copy of the form before submission and a copy of the acknowledgment after submission. No map has been made available, but the vague description suggests that the WiFi footprint will be similar to what is already available in Silver Spring. Here is the announcement from the city of Rockville. Eventually, AEPCO plans to install WiFi service elsewhere in Rockville (perhaps even throughout) but residents will have to pay for the expanded service area. No prices have been made available. The announcement also notes "will allow for paid subscriptions for residents and businesses that want to have a higher bandwidth and a higher quality of service for indoor areas within Town Square." So, it will be a low-bandwidth connection. And users will need to re-authenticate (the announcement mentions an initial splash screen with advertising) periodically, making lengthy connections (e.g., substantial downloads) unlikely with the free service. But for Rockville residents, this is a good thing. Not only does it make the town center more attractive but it suggests that there will be competition for internet service in Rockville. But before we start celebrating, note the time schedule: AEPCO has indicated that citywide expansion could occur within 24 months after service begins in Town Square. Within? Why does that sound like speeds up to 5Mb! I live next to Glen Echo, the smallest town in Montgomery County (population: 221). It's a cozy place (how many towns have their own 86-year old carousel and Wurlitzer band organ?) and I frequently bike through it and always enjoy reading their newspaper, the Echo. The current edition of the Echo has a curious item - the town was recently approached by the Coalition for Free Broadband and asked to write a letter to the FCC supporting the Coalition's proposal - that a nationwide network be established for free wireless internet access. The company behind this, M2Z Networks, claims that with 20MHz of currently-unused spectrum, they can offer "fast, free and family friendly broadband to 95 percent of the US population within ten years and pay 5% of gross revenues from its subscription services [insert lots of handwaving here]. M2Z has an application for the spectrum pending before the FCC and are looking for support. To my surprise, the Echo article says that "the Montgomery County Council and County Executive have agreed to support the Coalition's proposal." The following citizens have been nominated by the County Executive to serve on the Cable and Communications Advisory Committee. The terms are three years and unpaid. I know of David Friedman, as he has provided testimony at communications-related hearings before the county. I don't recall having seen any others at any CCAC-related meetings, so my hopes are not high that they have a serious interest and will make useful contributions. Some past members have served simply for resumé padding or, from all that I can tell, want of something else to do with their evenings. If you know of any reason why any of them would be inappropriate to represent your interests, contact the County Executive and County Council. The following two CCAC members have been nominated for another term. Suzanne is presently the CCAC chair. Kernan has been the Rockville representative to the CCAC for over 7 years already. Doesn't anyone else in Rockville have an interest in telecommunications? The new appointments and the re-appointments are scheduled to be confirmed by the County Council on May 8, 2007. They said "Waiting for Pepco." Shortly, several Pepco trucks showed and surveyed the scene: a tree had fallen across the street bringing down the support arms that had once been at the top of the pole. Everything that had been up there was now down here. Actually the wires were suspended about 7 feet above the road. The tree itself was near horizontal, resting on the utility lines. Blithely, auto drivers continued to drive underneath it - after passing through yellow Do Not Cross tape as well. After 10 minutes of discussion, the Pepco guys announced that everyone should go home and return in the morning. They gave several reasons why: 1) they had been working too many hours (16 hours) and needed a break, and 2) it was a huge job, and 3) it would be much safer to do this kind of work during the day. Left unsaid was that 4) it wasn't an emergency - at least not in their eyes. So the ten or so people got back in their trucks and took off. This was around 10pm. At this point, I decided I'd enjoy a little night air and see how many other homes were affected. So I walked around my neighborhood. Later, I created a map. You can follow it as I relate the rest of the story. I walked north on Brickyard and then doubled back on Masters. Rounding a bend, I encountered a Comcast crew on River Falls. They were setting up a generator to power their equipment. I watched as they opened a lawn box and saw that it contained what appeared to be three car batteries. They claimed it was enough to provide power through glitches and short outages ("a few hours"). I asked them what the point of the generator was, given that we were in a sea of blackness - homes with no power -- TVs and computers that couldn't possibly be working even if the signal was there. They pointed out that their equipment served some homes further down Stable that still had power - although when I asked them how they could tell, they admitted they were just guessing. However, they added that customers using phones served by Comcast could use them without power to the home - since they can run for 8 hours on battery backup. I pointed out that the outage had started at least that long ago. So any phones that worked initially would likely not be working now. They shrugged their shoulders and continued hooking the generator up. They said the generator would run about 18 hours before needing refueling. I continued walking; met a guy on Stable who was doing some late night repair. I was a bit concerned that he wasn't just robbing homes since house alarm batteries were surely dead as well by now and his truck was stuffed to the gills with "stuff". But he said he had just come from Home Depot and couldn't unload his truck because his garage door opener was electric. Eventually he convinced me and while we chatted, he handed me some ice cream sandwiches - they were already melting and probably wouldn't fare too well even inside his dead freezer. Good neighbor! I walked over to Darmuid Green at this point but the outage didn't go far in. As I turned back, I saw the tree crew drive off. Perhaps they finally decided to call? As I was about to turn in, I saw another crew at Brickyard and Hackamore. It was 12:15am and I found the same Comcast crew, hooking up another generator. I was pretty surprised because I felt like I had been walking for hours (and I left their first site after they did) and yet according to them, this was the only other generator in the neighborhood that had been deployed. The next morning (Friday), I woke to ... no electricity and 5 trucks parked on the street including a Verizon truck. One crew told me they were there to put the wires back up but, sigh, had to wait for (can you guess?) Pepco to ground everything. I found that very surprising as the previous night's Pepco crew had done that - at least that's what they said. And it stands to reason, they wouldn't leave with anything unsafe. However, the morning crews didn't believe me and said they would just wait for Pepco. While continuing to wait for Pepco, I asked the Verizon technician whether he had installed any temporary generators like Comcast. He said they weren't needed - there's no electrical equipment in their boxes - each home has its own individual fiber running all the way back to their central offices. Comcast on the other hand didn't fare so well. Not because people reported outages. Not because Comcast had to roll a truck to install generators everywhere power was out. And not because Comcast must have to maintain a huge number of generators sitting in a warehouse somewhere. No, the reason Comcast didn't fare so well is because not a single person in that 116 house area reported having Comcast Digital Voice service. A few tidbits to enjoy in honor of April 1. Hopefully at least one person will benefit from today's story. Maybe more. Like many retirees, my parents travel for months at a time. When they do, they redirect their US Mail to me. I open it, dial their cell phone and tell them which bills have arrived and for how much. They pay the bills over the web. This system works pretty well. As I was going through my parents redirected mail recently, I found a bill payment to Comcast. That's right - a bill payment TO Comcast. Not from my parents but from one Mary Hagan of Bensalem PA.
Why would Mary Hagan's payment to Comcast end up in my parent's mailbox? Her payment was addressed to Box 3005 in Southeastern, PA - so the payment went in exactly the opposite direction that it should have - northeast instead of southwest - ending roughly 50 miles off. Could she have made a mistake writing the Comcast address? Nope. She used the Comcast-provided payment coupon with its preprinted address - which showed through the appropriate opening in the Comcast-provided envelope. Ok, so USPS made a mistake. Mistakes happen. But USPS then forwarded the mail to me in Potomac, Maryland. Huh? The Post Office uses barcodes to expedite routing. But it wasn't an error in creating the barcode because Comcast preprints their own barcode on their payment coupon. So the Post Office had to misroute the correctly-barcoded envelope twice and maybe even more as it went through several post offices from PA to MD by way of NJ. But then I took a closer look at the due date and saw that it had already passed (USPS forwarding takes time to get wrong) so even if I sent it back the day I received it, late charges would still be due. I also considered calling Comcast but decided against it. Comcast has never been one to talk with you about other customer's accounts (rightfully so). Dropping it in the garbage and letting the customer take the hit of the late fee seemed pretty reasonable at that point. Was it worth my time and effort to send it back to Mary so she'd have evidence to tell Comcast that it wasn't her fault it was late? Would Comcast even accept that excuse? Around here, Comcast's late fee is $4/month. Nope, not worth mailing it back to Mary. I did however call her up - whitepages.com yielded her phone number readily enough. I figured I'd suggest she try to get the late fee waived - perhaps they would if she could only get Comcast to look at my blog! And I also wanted to ask her a few other questions - such as whether it had ever happened before. So I called her number and ... well, whoever answered the phone gave me a very chilly reception. I guess he figured I was a solicitor or pollster offering "free money" or something that sounded close to it. I don't blame him. Anyway, I tried. If anyone reads this who knows Mary (unlikely) or lives near Bensalem (a bit less unlikely) - perhaps you could let her know that she should request Comcast waive her late fee (I already know the Post Office won't cover it) since it wasn't her fault - or at worst, find a way to pay it without relying on the Post Office in the future. No, I'm not suggesting using Comcast's offer to extract funds directly from one's checking account. As I've said before, Comcast isn't trustworthy enough for that. (See Automatic Billing - Convenience That Will Cost You.) But online billpay from a bank or a service like Quicken or Money sounds much more reliable. Better yet, since I know there are Comcast officials who read this blog, perhaps they could take it upon themselves to waive Mary's late fee - or track down the Comcast official in Mary's region who can do so. PS: Why did I say earlier that I know the Post Office won't cover it? Because first class mail is a best effort service. Now where have I heard that phrase before?! As I mentioned earlier, the county's MFP committee was scheduled to review the performance of the cable franchises. I was unable to attend so I plowed through the packet - 42 pages of the same stuff as usual. I already mentioned in my all-too-verbose report (Rubberstamp This) from last week that Comcast was being fined. Some new statistics were mentioned but in the interest of brevity, I'll merely mention that Comcast failed to turn in all the 4th quarter data so no one can even tell whether or not they're in compliance. However Comcast finally did turn in data (late!) for the 3rd quarter showing it was out of compliance in all customer service areas. Most notable is the requirement to repair within 24 hours - Comcast was below the 95% level required by the franchise. Some positive news: Complaints about Comcast to the Cable Office were down 44% in the 4th quarter with, ahem, only 282 complaints. In contrast RCN's complaint level nearly doubled in the 4th quarter. Of course, the absolute figures are significant - Comcast had 282 complaints, RCN 16. The largest number of Comcast complaints were service-related. RCN billing-related. In the 4th quarter, county inspectors reported 2298 construction violations in the Comcast cable plant. (Construction violations include such things as improper grounding, missing guy wires, missing pedestal covers, and exposed temporary underground cables in rights-of-way. Note that the entire plant is not inspected in each quarter.) At the end of the year, 1447 remained unfixed. That's an astounding 63%. RCN: 526 construction violations. For the entire year, 2114 remain unfixed. If Comcast was astounding at 63% remaining unfixed for the year, RCN is super-astounding at 87%. Congratulations you two! Earlier, I mocked a Comcast representative for suggesting that pixelation problems in the digital channels were not easily solvable. People are still complaining about these. And although the complaint levels have gone down, the county's outside consultant, Columbia Telecommunications Corp, says that this so-called tiling remains an ongoing problem. CTC asserts that these complaints are issues in the local wiring and have recommended that Comcast replace customer drops as each is converted from analog to digital. If problems remain, CTC recommends Comcast send technicians that are trained to diagnose and fix such problems. Bottom line: The problems are diagnosable. Are fixable. (But here's the rub...) With trained technicians. Oh, and if you don't complain, don't expect your problems to clear up. This is a test of Google's new blogging software. That's all it is. This is the last sentence in the test. This past Wednesday (Jan 24, 2007), I attended a meeting of the Cable and Communications Advisory Committee (CCAC) for Montgomery County, Maryland. This is a meeting of citizens who volunteer to meet once a month to discuss cable-related issues and advise the County Executive. As I've said before, it's difficult to tell whether the committee has an impact any more. As long as I've been writing this blog, I've encountered nothing to justify its existence. Despite this, 14 people felt motivated enough to answer the call to fill four open seats on the committee. Their term starts in November of ... 2006. A Cable Office official speculated the seats might be filled by April - in other words, 6 months late. Note that some citizens apply for many committees simultaneously even though they may only serve on one committee at a time. I guess people figure that it's nice to be on a committee, any committee. So it's unclear which if any applicants are really interested in cable issues and which are merely tired of bitching that Verizon isn't on their street yet. The committee complained about this too and asked the Cable Office if the Executive had standards that could be imposed to winnow down the list of applicants. The Cable Office said no. Ergo, 14 full interviews coming up. You can tell that applicants don't have a clue when they've never even bothered to attend a meeting before applying. One applicant joined me in attending the meeting (hi Art!) and said he found it worthwhile. I do agree that it's worthwhile to attend as a guest - I learn a fair amount from the briefings given monthly by officials such as the MC Cable Administrator. However, it shouldn't require a committee to receive these briefings. News should be promptly made public via the web. This very idea - making news available promptly - was made, albeit indirectly, several times during the meeting. For instance, the committee asked if the Cable Office could issue press releases when issuing fines against franchisees. Donna Keating, acting Cable Administrator, said that the Cable Office doesn't issue press releases. Actually, the Cable Office does make a fair amount of information available online - although I'd like to see more. But lacking is any kind of notification mechanism to let citizens know when information has been made available. I've been asking the Cable Office for this for 6 years. Even a simple email list would be better than what we have now (i.e., nothing). This is all rather sad for a committee with Communications in its name. As far as I know, the committee itself doesn't even have a mail list. Nor are there public archives of the meetings in either video or written form. I went so far as to create a mail list six years ago as a yahoo group, started posting the committee minutes and other documents to it, and the committee used it for a year until the Cable Office decided that they wanted direct control. That was the end of it. The Cable Office assured me that the county's IT department would provide an official mail list and webspace. Over the years, the committee occasionally queried Alisoun Moore, MC CIO, on the status of that request. No response was ever heard. The latest news is that Alisoun has stepped down and the county is in search of a new CIO. Anyone interested? Perhaps someone who knows about mail lists? RSS? Web pages? Videos? Communication? It's not that hard, is it? Perhaps the only activity with the potential for real work that regularly faces the committee is the opportunity to weigh in on the cable budget. The cable budget is roughly $15 million. This supports the PEG channels, the Cable Office, the inspectors, the lawyers and the county network ("I-Net" or "institutional network"). The majority of the money for this comes from the franchise fees paid by cable TV customers. Amy Wilson of the Cable Office gave the briefing on the budget. Briefing is an apt word because it was all too brief. She provided no new numbers but rather the old estimates from last year and asked for comments before they were sent back to Executive Leggett and on to the Council. But her deadline was February 5, meaning 7 business days. The committee has never been able to turn things around so quickly - so after making a show of staring at the spreadsheets for a minute and plaintively asking for guidance from the Cable Office (which refused), the committee agreed to rubberstamp the existing numbers without debate and provide a letter supporting the old figures in the budget - figures which presumably won't be the ones issued by the Executive. (The budget subcommittee nominally left the door open for last minute observations in the remaining few days but I don't see that happening.) Bottom line: Nominal budgetary support without justification. Or in more familiar terms: Taxation without (meaningful) representation. Amy pointed out that the Executive asked the Cable Office for two budgets: one capable of sustaining existing operations and a version with a 5% cut. The Cable Office didn't share where the 5% might come from nor did the committee ask. Besides a new CIO, there are a few other changes in personnel worth mentioning: Jane Lawton, MC Cable Administrator is off to Annapolis again as a Delegate for District 18. She is expected back mid-April. In her stead as Acting Cable Administrator is Donna Keating who normally takes care of the G (Government) of the PEG channels. Suzanne Weiss is the new chair of the CCAC. Suzanne appears to be continuing the same procedures created by outgoing chair Shep Bostin. The most unfortunate of these is to restrict public questions until the end of the meeting - when context has been lost, when visiting officials have left, and committee members are half out the door as well. Suzanne officially ended the committee's secretarial position. I suppose it was a formality but one that bears mentioning because the Cable Office is in charge of recording the committee minutes, a practice which I think inappropriate given that the committee sometimes has very different opinions than those of the Cable Office about what is important and what is not. Comcast has a new VP of government affairs. I don't know the name but this person will be responsible for both Montgomery and Frederick. Is the Frederick cable system (which includes the old Adelphia franchise) in good shape? What's the regulatory environment there - does anyone know? Finally, Sonya Healey has moved on from her position as the council staffmember responsible for cable matters. I'm sorry to see Sonya leave as she did an excellent job. She prepared the council briefing packets - very thorough and well written. She was happy to talk or email whenever citizens wanted and provide whatever they requested. And she regularly emailed briefing packets and agenda in advance, providing alerts for items of significance that were upcoming. She was the ideal of a county employee. I understand Sonya's new position is chief of staff for Councilmember Ervin. Ervin in turn worked in a similar position herself prior to winning election to the Council so perhaps Sonya is following in her footsteps. Sounds good to me! Comcast appears to be resting on its laurels, rotted as they are, and enjoying the slow speed of Verizon's deployment as well as the resistance of consumers to try satellite, and the confusion of the marketplace, particularly with respect to higher tiers such as HD (where providers make a huge profit). A good article about the complexities of the local marketplace appeared in this week's Washington Post in which Howard Bryant and Rob Pegoraro described the difficulties and disappointments of the choices. I mentioned recently how the (ostensibly) technically superior service of Verizon could still be unacceptable - giving my own case as an example. Meanwhile, Comcast is being fined again by the county for violations of the customer service provisions of the franchise related to telephone answering time in the 4th quarter of 2006. The new fine is roughly $12K. As one member observed, this is well below the cost of hiring another person to answer phones so it's not surprising that Comcast would gladly pay the fine rather than avoid it by increasing staff. I missed the last two committee meetings and so was surprised to see the committee continuing to flagellate itself over the cable consumer rights brochure. To recap, this is a one-page brochure that I drafted years ago and made the mistake of believing the committee could agree to publish with minimal additional work. Since then, the brochure proceeds to come up at each meeting: yet a new draft is shown, members recommend changes, ask what the hell it is or what it means, some condemn it as incomprehensible, and discuss yet again how it should be distributed. And the committee has also been jerked around by the county lawyers who evidentally feel there is something illegal or immoral about the whole thing. This month the committee reported being rebuffed by a representative of the Office of Consumer Protection which publishes a lot of similar brochures and, when asked, declined to help instead suggesting that the committee take responsibility itself. CCAC Vice-Chair Joy Ragsdale observed that one Don Libes had made a version of the brochure complete with county logo available on a website which would lead to confusion between it and the official one. I doubt that - not only is much of the text different but so is the title! In any case, it's surely a moot point. The latest move by the committee was to turn the whole thing over to the Cable Office - which surely means a final death - because the Cable Office always wanted to kill the brochure. There is no one in the Cable Office who has a burning desired to invest any effort in the brochure. The committee didn't ask for my opinion on any of these issues - even though I was sitting right there as they continued to throw my name around. Note: Since 2006, members of the public have not been allowed to speak unless specifically called on by the committee. If they had, I would've suggested they drop the whole thing and return to the useful parts of the meeting - the briefings by the Cable Office and other visiting officials. Jane met with Richard Turner and Theresa Cameron regarding the MCT volunteers. The situation is still very delicate since MCT Volunteers who have been with MCT for years are attempting a take over by regaining board seats with the intention of remoing the current executive director. An arbitrator is now in place to assist with resolving the issues. I have no idea what that really means but at the request of committee member Yen-Ju Chen, herself an ex-PEG official, the "delicate" sentence was stripped from the official minutes. If there is further interest in the PEGs, I'd like to cover what they're doing (and why they need so much money!) to do it. Let me know if you'd like to read more about the PEGs. And tell me which PEG shows you watch. Thanks! Montgomery County's MFP committee will be holding a quarterly hearing on the county's cable franchisees. This will be the first meeting with Verizon as an official franchisee. Are we still in the honeymoon? We'll find out. February 5 at 9am on the 7th floor of the Council Office building. My guess is that the honeymoon is still on (and the council has its hands full of other problems) but I've heard a lot of complaints from people waiting to get fiber and not understanding that, well, it takes time. And Verizon, despite wanting to roll out service as quickly as possible, has plenty of time built into the franchise. Please calm down folks! I've got my own problems. I've become dismayed to find - as I had feared all along - that I cannot get any kind of device with which I can readily schedule recordings of FIOS TV on my computer. I really don't want to get a separate DVR and display. Might I end up with FIOS for internet and Comcast for TV? Egad. And please don't tell me the quality of FIOS TV is so much better. Or that it costs more this way. I accept this. Or do I. This is so frustrating. The County is looking for citizen volunteers to serve on the Telecommunications Advisory Committee (TAC). This committee advises the County Executive and County Council. Well that was always the theory anyway. Very little advising has taken place in the years that I've been observing the committee. For example, the TAC was not invited to any of the Verizon negotations or strategy sessions held by the Executive. Just about everyone involved shares some of the blame for lack of communication. (Well, the council wasn't invited either so I can't blame them too much.) I've explained the problems several times before so I won't repeat them again. (Browse the archives.) Hopefully, new members will be more informed and willing to work. And perhaps the new Executive will be more interested in the committee's opinions. There are five openings on the committee. Four members are eligible to apply for a second term. But I would assume that most of them won't. If you have any questions about the committee, please post them here and I'll answer them. And attend the meetings to see what goes on. Hmm, looks like the Cable Office hasn't been updating their online calendar. Sigh. Assuming they stick to the usual schedule (3rd Wednesday of each month), the next TAC meeting should be January 17, 2007. However, I see the official solicitation for new members says that meetings are on the "forth (sic) Wednesday evening of each month." A new strategy to keep attendance down? Incidentally, if you'd like to serve on another committee, here's the full list of openings. Hmm, I just tried clicking on it and got Windows NT Error number 2 occurred. (And I know it's not my computer since I'm not using Windows!) Maybe you'll have better luck.